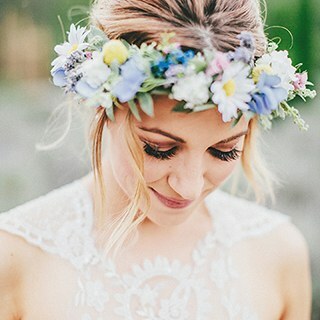 Whether you are attending a festival, getting married or having a bridal shower, a flower crown can be a gorgeous statement piece all your guests will be talking about! That said, we are giving a mid-week 3-step guide on how to make a gorgeous floral crown fit for any occasion! Tip: Attending Coachella? It's not to late! Follow our easy step-by-step guide below to create a unique addition to jazz up any outfit. 1. Using the floral wire create a circular shape, rest on the top of your head to see what size the circle needs to be. allow extra room for once the flowers are on. Tape the circle shut with floral tape, you’ll want to wrap the tape around the wire several times. 2. Have your chosen greenery and flowers nearby. You’ll want to start your crown with a layer of pretty greenery that covers the wire, which will act as the base of your crown. Tape the greenery down using your floral tape. 3. All done? Great! Now it's time to add your beautiful flowers! The flower stems must at least be 3 inches long to attach them to the crown. Much like you did with the greenery using floral tape, tape the stems to the crown. Make sure you wrap the tape around the stems three or four times to hold them into place. Now your crown is ready! See how easy that was? This is a super fun idea for a bridal shower to get all your girls together and recreate something you each will enjoy! You can even add different types of flowers for a textured look. I personally like to add a ribbon at the back for an extra special surprise! It especially looks stunning in the wind. Please feel free to share your creations with us and tag us on Instagram!